Richard Davis (left), Chair of the EMI Special Interest Group Steering Committee, presents Cliff Glantz with an award for exceptional service during the group's annual meeting in May 2007. On May 9, Pacific Northwest National Laboratory researcher Cliff Glantz was presented with a special recognition award at the annual meeting for the Department of Energy's Emergency Management Issues - Special Interest Group. 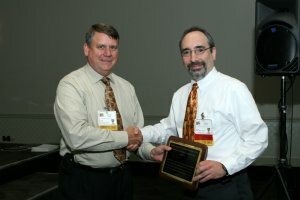 In front of about 250 colleagues, Cliff was given the award for sustained outstanding services to the EMI Special Interest Group, "particularly in his role as chair of the Subcommittee on Consequence Assessment and Protective Action [SCAPA] and for exceptional contribution to the DOE Emergency Management Program in general." For the past five years, Cliff has chaired the SCAPA, which became a part of the EMI Special Interest Group three years ago; prior to that it was an independent DOE committee. Through its working groups, the SCAPA provides DOE and its contractors with technical information and recommendations for emergency preparedness to assist in safeguarding the health and safety of workers and the public. Cliff became involved in these organizations through his work developing consequence assessment models and participating as a meteorologist and hazards assessment team member in the Hanford Emergency Operations Center. Cliff is a staff scientist in the Applied Atmospheric Sciences Group of the Atmospheric Science and Global Change Division. His emergency preparedness work is supported by the DOE Office of Emergency Management and Policy (NA-41), the Hanford Emergency Preparedness Program, and the Laboratory's Facilities and Operations Directorate.